Hollyhocks thrive in the Loire Valley, and often grow as pavement plants. 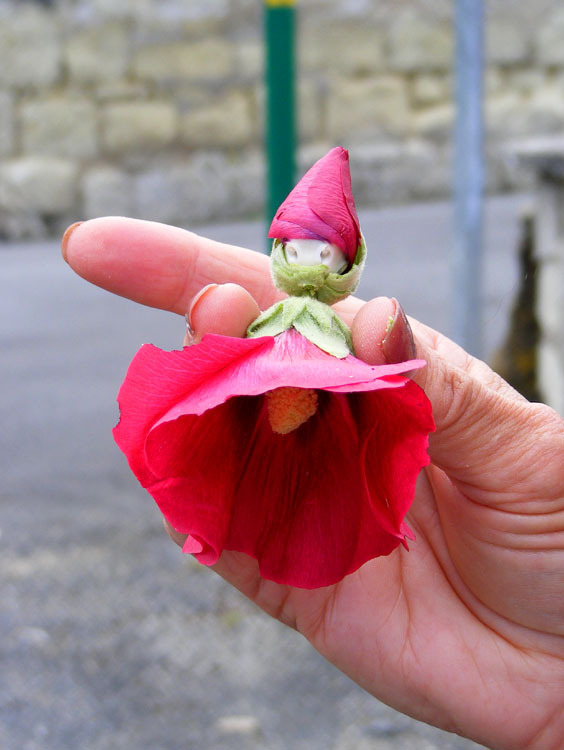 As we walked through Parnay a client picked a flower and a bud and created a lady. 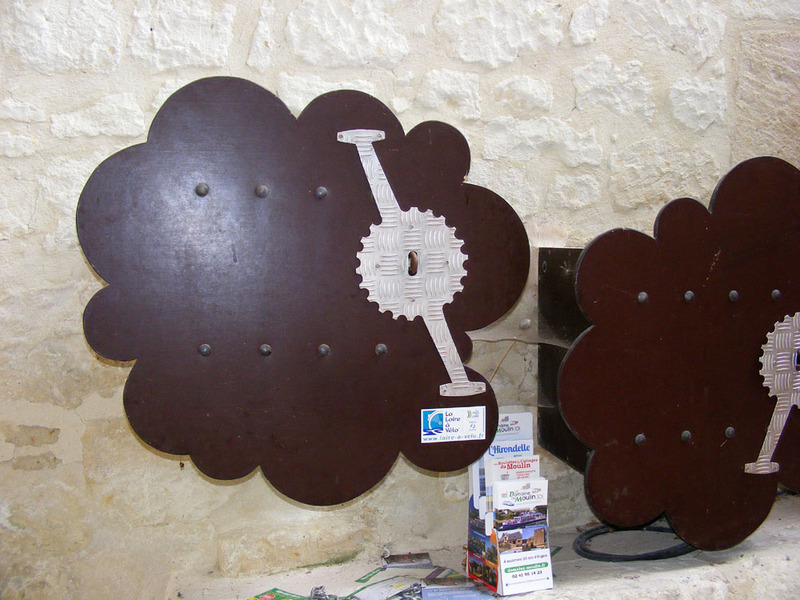 Lockers for cyclists at the artists colony, Turquant. The cycling politician I've quoted above is the Belgian chief Brexit negotiator for the European Parliament. Frankly, it is him and his French counterpart for the European Commission, Michel Barnier, that we are relying on to protect us. The British government clearly doesn't give a toss about us, except where they can use us as bargaining chips to manoeuvre in terms of EU citizens living in Britain. My British member of parliament (a longstanding Labour member) no longer responds to my emails. In contrast, Elmar Brok, on Verhofstadt's steering committee sends personalised responses within 48 hours. For an idea of how the British government is prepared to treat EU citizens in Britain, read this Guardian article. This presumably custom bicycle belongs to Gandalf as far as I can tell. I encountered it whilst making a toilet stop at Turquant with a walking group. When we got there the men's toilet was locked. We assumed it was occupied and the men just waited a bit. The minutes went on and the door didn't open, so we assumed it was out of order and the men lined up to use the women's. Finally, to our surprise, the door of the men's toilet creaked open and this bike emerged, propelled by a rather extraordinary looking man with long white hair and beard, a slightly sheepish expression and dressed in what looked like handmedowns. We smiled and tried to look friendly, as did he, but no words were exchanged. 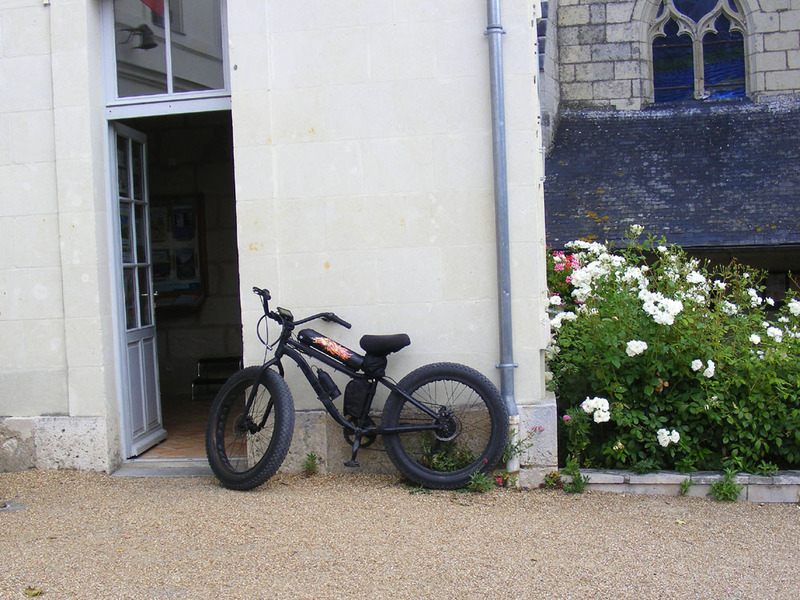 We watched as he crossed the courtyard, parked the bike against the unmanned tourist office wall and went inside. He didn't emerge again. Our impression was that he had spent the night in the men's toilet. I would have loved to have taken his photo but felt it was a bit intrusive and didn't like to ask. For many locals Léonard Perrault is just the name of a street in Amboise, leading down from Clos Lucé to the Porte des Lions at the Chateau Royal. 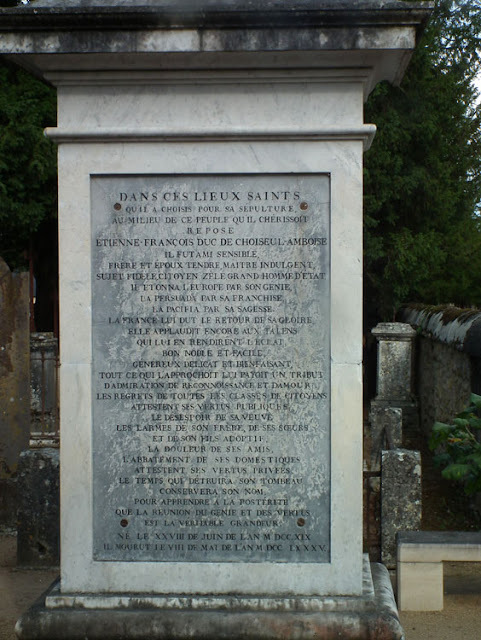 But for anyone familiar with the cemetery in Amboise, they will know that there is a monument to the man right next to the Duc de Choiseul's, once Louis XV's chief minister. 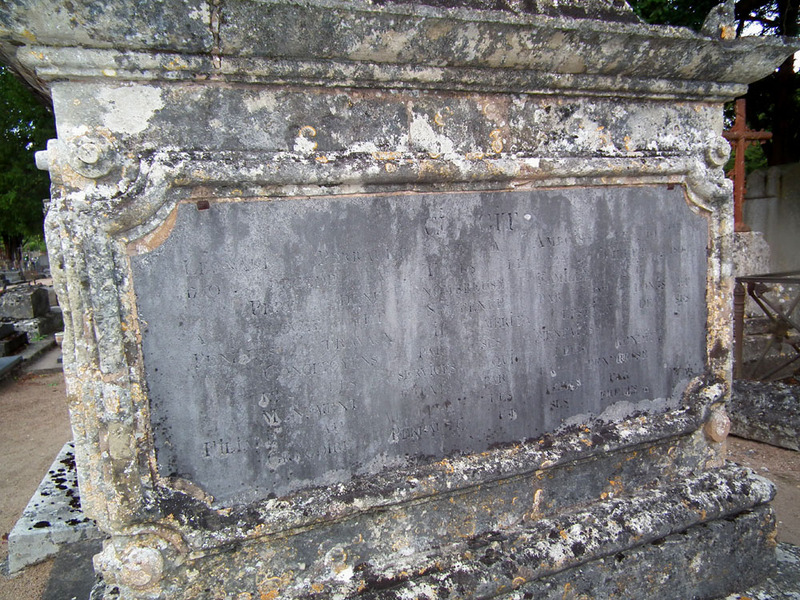 The inscription on the Choiseul tomb to the Duchess. Although it begins 'here lies' the date has never been added at the end. Perrault was a young man from Amboise of humble origins who rose to fame and fortune thanks to the Duke and Duchess of Choiseul. All his adult life he maintained his connection with them. Born in 1750, his hard work on the Duc de Choiseul's chateau of Chanteloup was noticed. To encourage and reward him he was given a donkey and a cart. This was the beginning of his rise, enabling him to succeed in his trade as a mason. Ultimately he became an entrepreneur working for the King, responsible for building the levee banks along the Loire at Amboise. He spent ten years constructing the bridge over the Loire at Amboise but also operated a ferry to enable crossing in the meantime. Having a good head for business, he made a fortune. 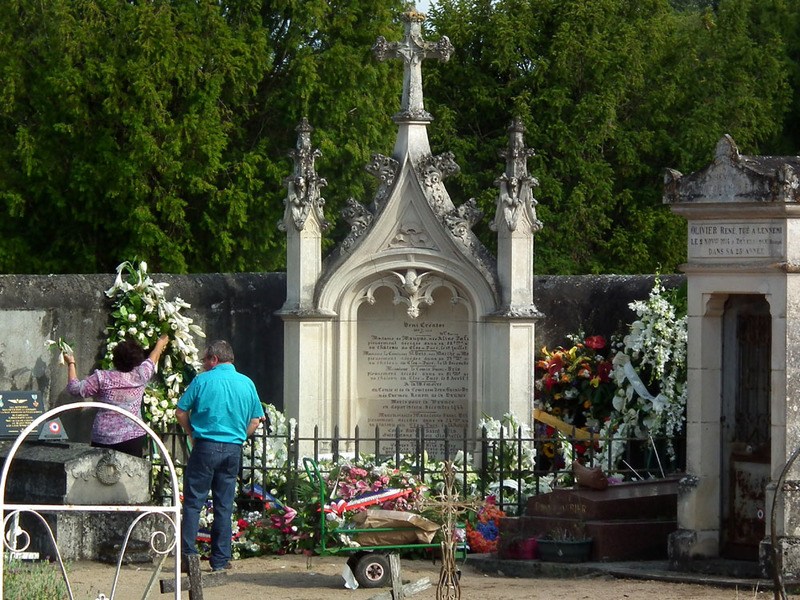 The Duc de Choiseul's tomb (centre), Léonard Perrault's tomb (left and slightly behind). The histories of Perrault's and Choiseul's adjacent tombs are intimately linked. The Duke died in 1785. 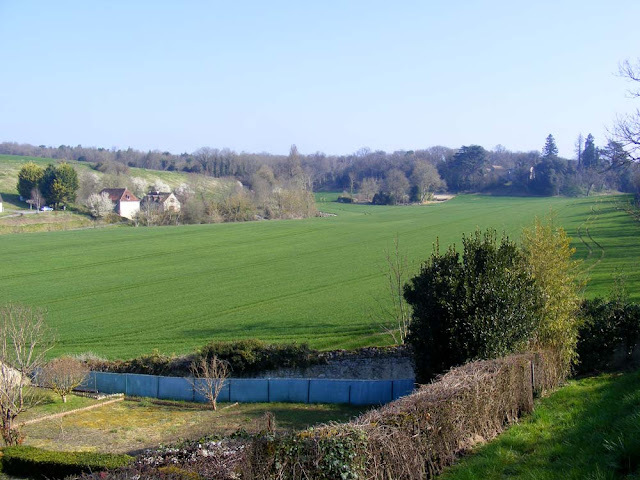 He had already bought some land for his last resting place in Amboise. He offered the site to the town and it is now the town cemetery. A mound and then a mausoleum was raised on his grave. During the Revolution his tomb was demolished to recover the lead. The Duc de Choiseul's eulogy on his tomb. 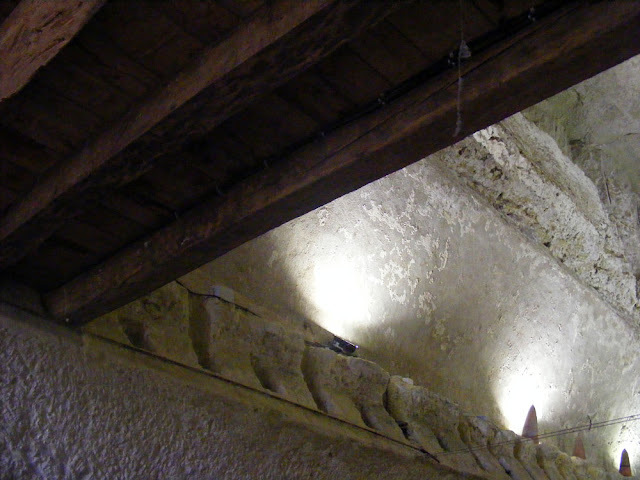 In 1802 Léonard Perrault, who had saved some pieces of the tomb, sought the right to reconstruct it. He financed the rebuilding on condition that he could be buried next to the Duke. At the time, the Duchess, ruined by the debts her husband had left, lived in a small apartment in Paris. Perrault, who by this time was wealthy, did not forget her and supported her financially. He died in 1815, leaving 18 children, who erected his tomb next to the man who had given him a leg up all those years ago. His tomb was listed as a historic monument in 1962, a few days before Choiseul's was also listed. The Choiseul monument has been restored several times, unlike Perrault's, which is now in a rather shabby state. Many thanks to Pamela Shields for alerting me to this story and showing me the monuments. 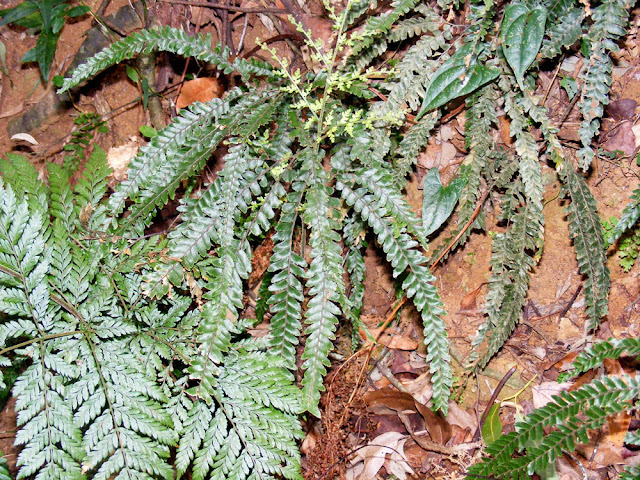 A selection of native Australian ferns growing wild in the rainforest at Ravensbourne National Park on the Great Dividing Range in south-east Queensland. 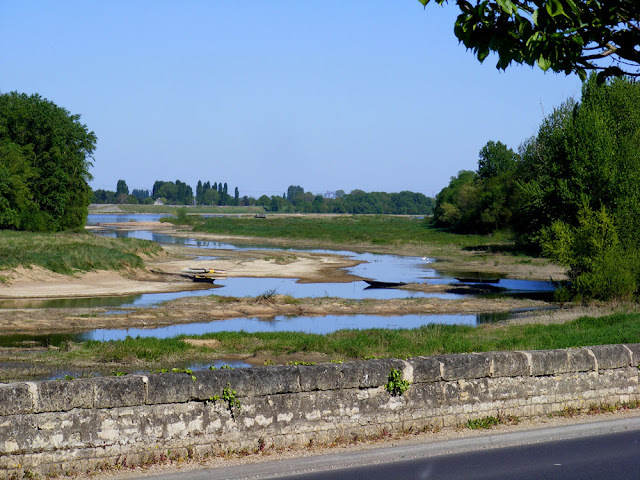 After a number of dogs of died due to poisoning with cyanobacteria in the past couple of weeks it is not safe to go swimming or engage in aquatic activities west of Chinon, in either the Loire or the Vienne. A branch of the Loire near Souzay Champigny. Presumably livestock and wildlife are equally at risk. 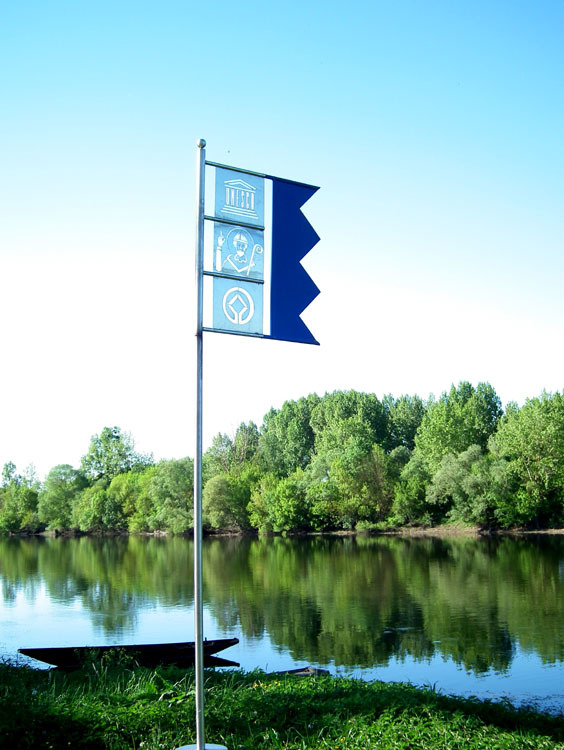 A family from Chinon were swimming in the Vienne near Beaumont en Véron, downstream from the bridge by the fire station. They think their dog must have lapped up some water with the dangerous algae as it was later vomiting then convulsing. The dog, a seven year old German Shepherd, was quickly taken to the vet, but was dead by evening. Another dog was treated for convulsions the same evening, after swimming in the same area. Happily the vet managed to save this second animal. A branch of the Loire at Souzay Champigny. Definitely take care here. A representative of the Chinon sub-prefecture has said that even if the cause of death has not been established, the event is similar enough to other dogs in neighbouring départements, which were caused by cyanobacteria that had developed thanks to sun and light in certain slow moving or stagnant waters. The Laboratoire de Touraine will perform an autopsy on the dog and confirm or otherwise that cyanobacteria was responsible. The Vienne at Rivière. I'd be keeping my dog on a lead here, even though it's east of Chinon. 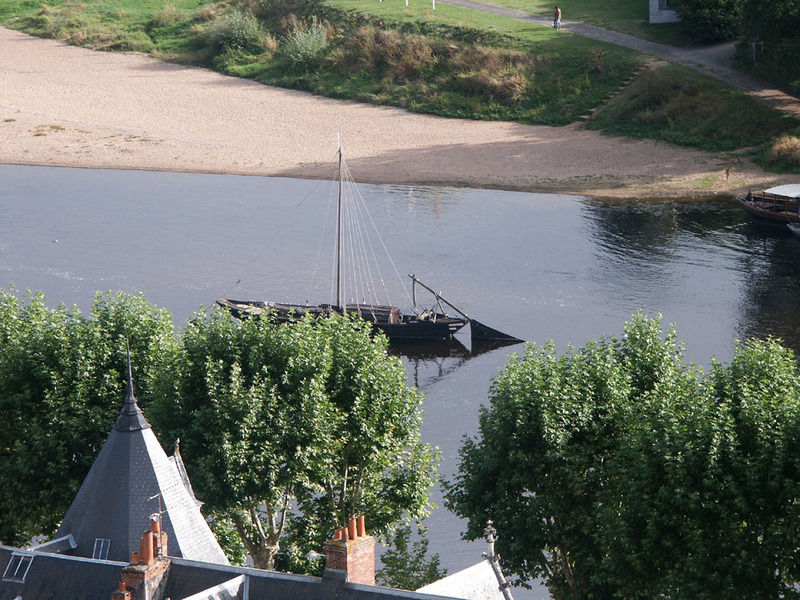 The beach on the Vienne at Chinon. Safe to swim if monitored. At the moment, the authorities are asking that people keep dogs on leads as a precaution and that people don't swim in shallow or stagnant water which has a significant algal load. You are advised to swim only in the regulated zones. 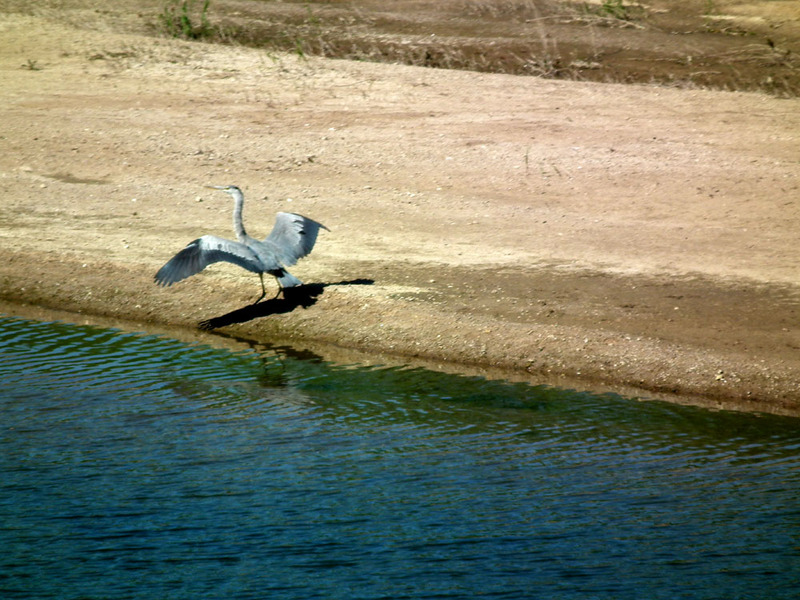 Don't let your animals drink from the river or swim, don't eat river fish and don't pick things up out of the river. Aquatic sports are not forbidden but you need to be careful. Don't swim where it looks dodgy and wash yourself and your equipment thorough after any contact with the river. According to the local newspaper there was 7mm of rainfall last Tuesday in the Touraine du Sud. It was enough to stop the pasture from curling up and dying, but that's about all. This area is particularly diversified in terms of its agricultural activities, so it provides a good overview for the local agricultural development officer. 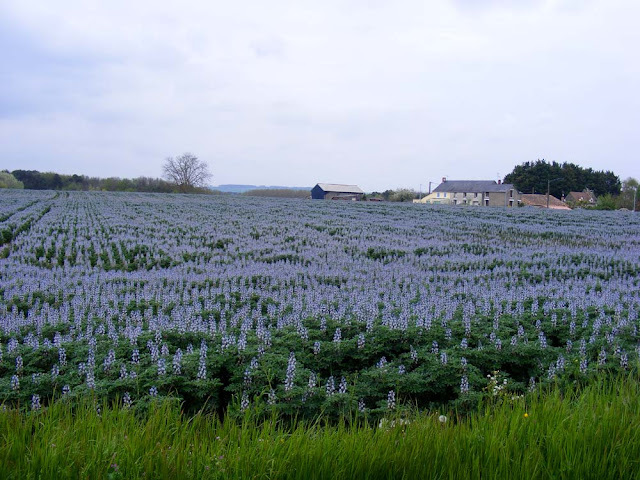 Lupins, a crop that likes sandy soil, in the Vienne valley. He says that the lack of rain would not have had such a negative impact if the département wasn't already in a state of water deficit. There was drought in 2015, then despite the floods in June 2016, the water levels since July 2016 have been low. We did have significant rain in November last year, but not enough to bring the water levels up to normal. 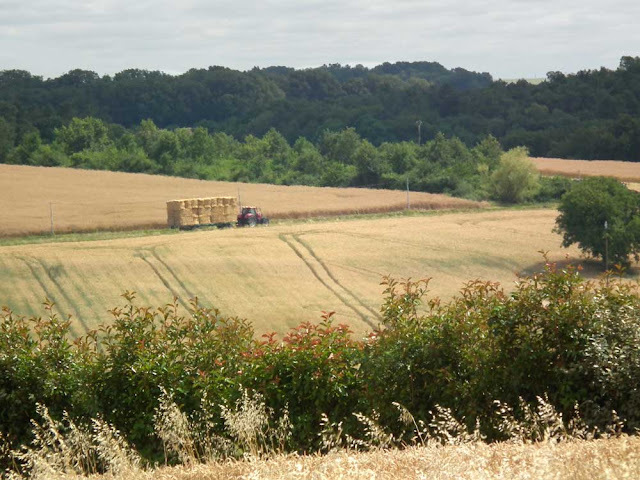 He added that whilst we haven't technically had a heatwave in the last couple of months, crops have been subjected to considerable heat stress. The high heat of the end of June and the first couple of weeks of July could not have come at a worse time for the summer crops, falling as they did just before the first maize silage should have been cut. 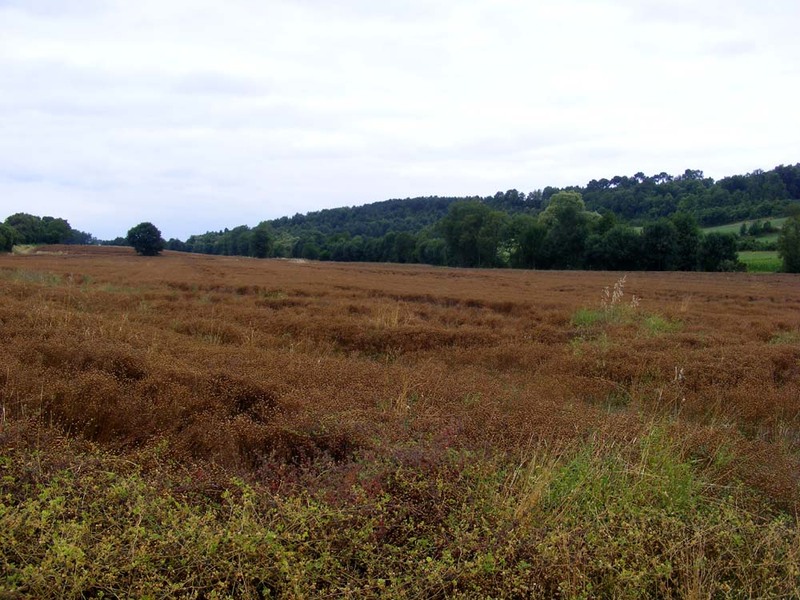 Flax, a crop that doesn't like hot dry conditions, in the Claise valley. Obviously, whether a crop is irrigated or not makes a big difference. But contrary to popular belief, not all farmers irrigate. Irrigation is expensive. The farmer has to pay for the water, the electricity and expensive equipment. In irrigated fields the impact of this year's weather is minimal, but in dryland areas, there has been a 10 - 20% loss of productivity. The ag officer says it's difficult to be categorical though. It all depends on the soils, which vary considerably around here. You can find everything from dry sand along the Creuse to loam on the Saint Flovier plateau. Maize on sandy Creuse valley soil, with irrigation equipment in place. The same thing applies to pasture and oilseeds. Thanks to recent light rain they aren't totally crispy fried, but canola and sunflowers will be about 10 - 15% down. Soils are like us -- they sweat in summer, and at the moment, there is too much evaporation. Also, a surplus of water in autumn is as bad as a lack in summer. With climate change this situation will tend to become the norm. Another thing that farmers must bear in mind. 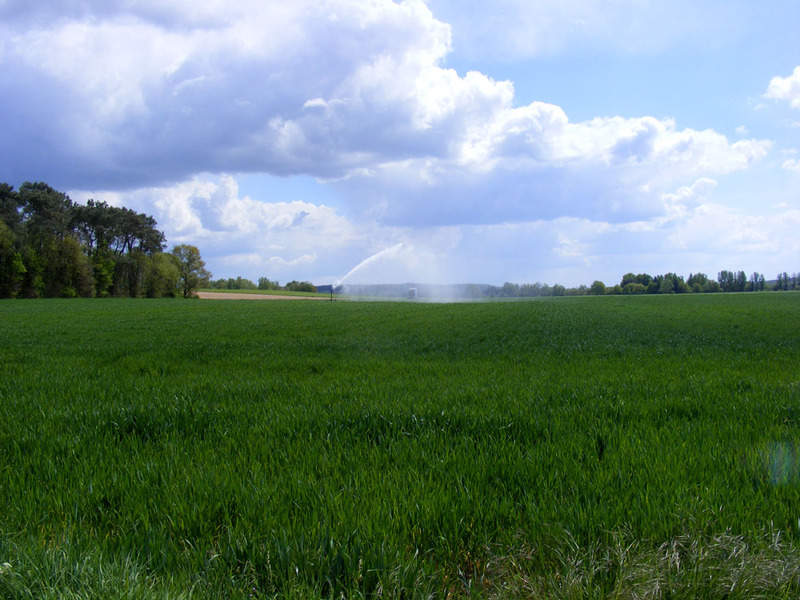 Wheat being irrigated on sandy Creuse valley soil. Farming experts here don't think there is a single miracle answer. In fact, whilst experimental work being done on new varieties of crops is useful, each farm will have to develop their own solutions, on a case by case basis. The local newspaper had an article yesterday about farmers' concerns regarding recent national budget cuts to grants made through the Common Agricultural Policy (CAP, or PAC if you are French). 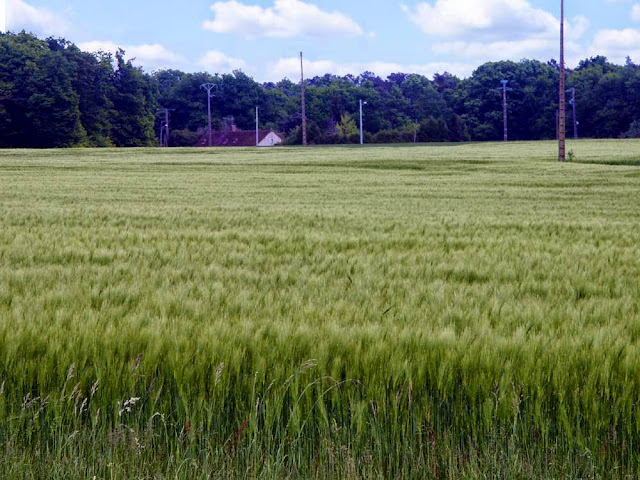 France has the most land under agriculture of any of the EU countries, so the CAP is particularly important here. Local farmers union members called an on-farm meeting with our local representatives in the National Assembly to get their point across. The 'disadvantaged' southern Touraine countryside. The farm near Sepmes that they meet on runs dairy cattle and grows grain which is used to feed the stock on farm. The farmer is a young woman of 30 who is in the process of buying the business from her former boss, an older farmer who is retiring. The hand over period is three years. The farm is 60 ha with 70 dairy cows and maize cultivation, partly irrigated. Under new rules just announced the new owner will not receive €6500 that she had hitherto been expecting as a grant to aid the transition. In addition, there has been a major redefining of agricultural areas considered to be 'disadvantaged' and she will lose nearly as much because of being recategorised. 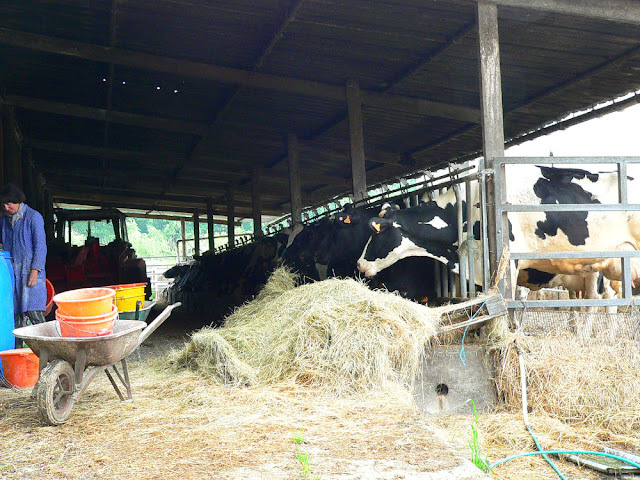 A local dairy farm (photo courtesy of my father). The reason for the budget cuts at a national level are because of an EU decision to shift 4.2% of the CAP budget from direct farm payments to the more general aim of 'rural development'. These two types of payment are known as the 'twin pillars' of the CAP. In the past the direct farm payments have been aimed particularly at supporting the markets and protecting the incomes of farmers. The new focus is looking more towards the environment and farmers are having a hard time swallowing it. The farmers union is at pains to point out that it is not just graziers who will lose out, but, for example, a cereal farmer with 150 ha will lose €1300 a year under the reforms. The farmers are also not happy about the new boundaries outlining the disadvantaged areas. The Touraine du Sud (that's us and the area around Loches) is 'disadvantaged' but the Sainte Maure plateau (where Sepmes is) is not. The reforms have been pushed back a year and the farmers are determined to make the most of the repreve. But the clock is ticking. One dairy farmer pointed out that when he started out there were ten dairy farmers in the immediate area. Five of them remain today and there will be no more than three in six months time. On one level I sympathise deeply with these farmers. I know they have long term plans that have been scuppered by this change in government policy and they are struggling to see a way forward. But the truth is the CAP direct farm payments are a really blunt instrument. Essentially farmers are paid for just owning the land, and the more they have the bigger the grant they receive. My local organic market gardeners and orchardists have very little land, and receive very little in the way of EU grants. On the other hand, the big cereal farmers are getting tens of thousands every year, and choosing to ignore the environmental damage they are causing. 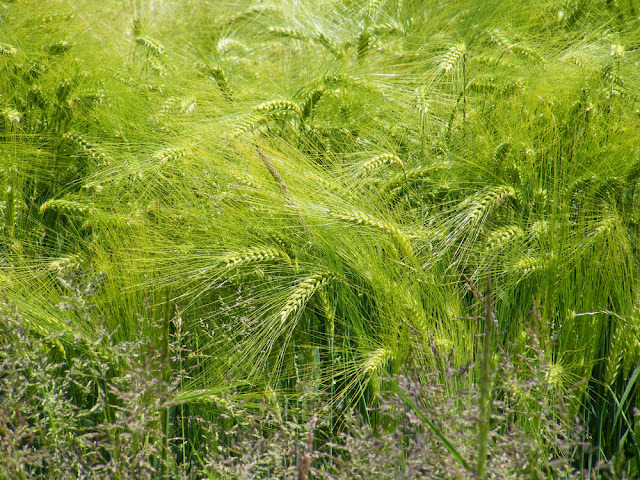 Modern agricultural practice is having a huge impact on our environment. 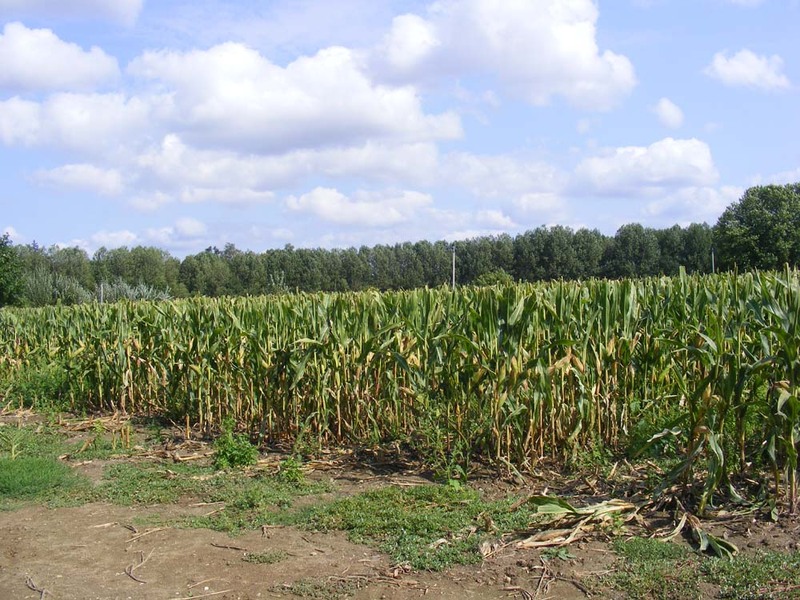 It ruins soil quality (by heavy machinery and deep tillage), water quality (by runoff of pesticides and excess nutrients) and air quality (by creating a toxic mix of ammonia from manure and diesel fumes). The CAP is currently not set up to adequately deal with these issues. Something must change, and farmers must be incentivised to change how they do things. 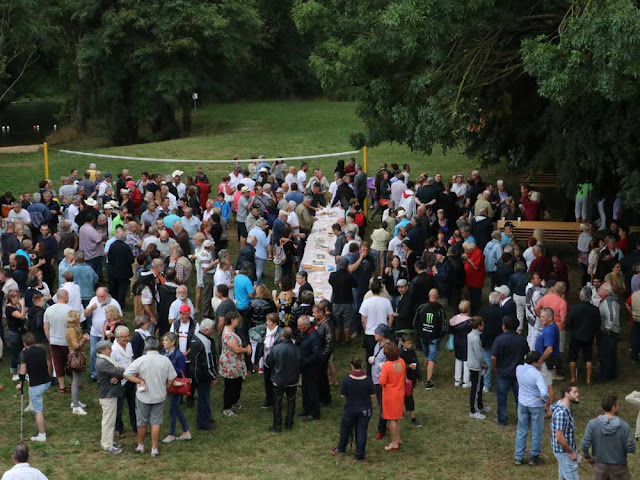 One of the things that struck me about the Grand Défilé (Grand Parade) of the recent Comice Agricole (Agricultural Show) was how many people got smartly dressed to attend. They were also nostalgic, happily reliving a social occasion they remembered fondly from their childhood. Lots of people my age and older reminisced about Comices in the past. Mid-afternoon of the great day we got a knock at the door. It was Gérard, who grew up in our house, and his wife Marie-France. They were in town because they wanted to catch the Grand Défilé, and they had brought Gérard's sisters to meet us and see what we've done to the old place. It was fascinating hearing the three of them discussing what they remembered and how the rooms were laid out. There was a minor argument about where the kitchen stove was, but it was eventually established that Gérard and Claudette were talking about two different stoves. He is older than the girls and remembers more. He remembers for example, when our laundry had an external door. It was wrought iron and always locked. He can't ever remember it being used. Claudette could remember the big table that sat in the middle of the kitchen. Their grandparents employed a number of men and in those days everyone ate lunch together around the big kitchen table. Claudette reckons it was about eight people every day for lunch, which I assume her grandmother produced. Their family also owned our neighbour's place and they can remember the linden tree in their back yard being planted, so it's about 50 years old. Apparently it used to have a companion. After the visit Claudette emailed me a copy of the deed when their grandparents purchased the property. It dates from 1900, and we will have to pour over it to extract all the interesting little tidbits of information it doubtless contains. Gérard is vastly amused that one of our Tractions is called Claudette. She was named before we even knew of his sister Claudette's existence, but she is chuffed to bits to have a namesake in the garage. 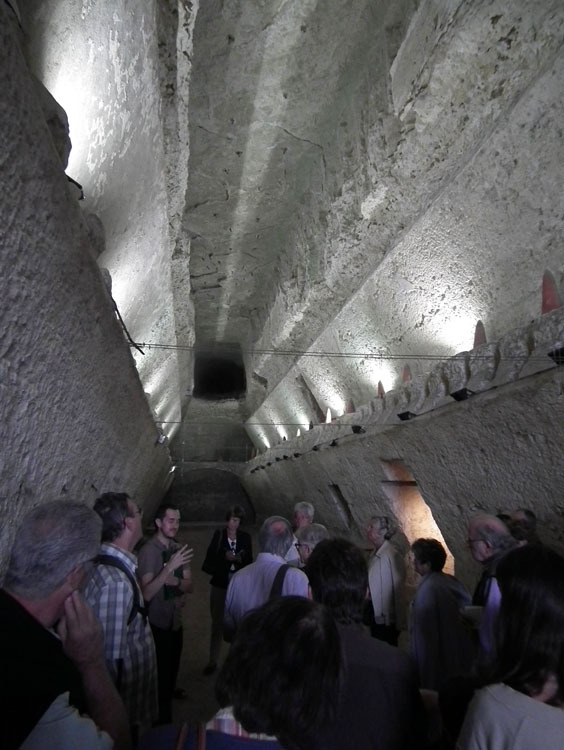 Recently we had the opportunity to visit the Greniers de César (Caesar's Granaries) in Amboise. They are privately owned, by the Hotel Le Choiseul, and access is by guided visit or permission of the hotel only. Once the Duc de Choiseul's townhouse, now a luxury hotel. They are well worth going to see if you get the chance. Consisting of several large tunnels gouged out of the limestone spur that Amboise is built on, they don't sound very exciting, but believe me, they are stonking! The site was originally occupied by an Italian hermit called Francis de Paule, who came at the request of Louis XI in the middle of the 15th century. The Duc de Choiseul, former Prime Minister to Louis XV, took over the site about 1770, when he was sent into exile by the King. Looking up at the tunnel entrances. The 'Granaries' are a series of vaulted tunnels excavated from the limestone. Their length varies from 40 to 90 metres and they are 12 metres high. 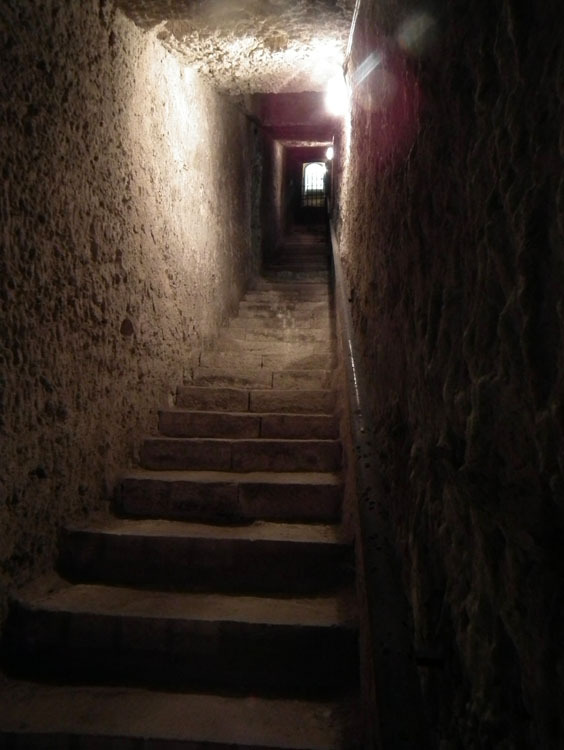 The lower tunnel was dug independently of the others, the upper ones are divided into three by wooden floors. 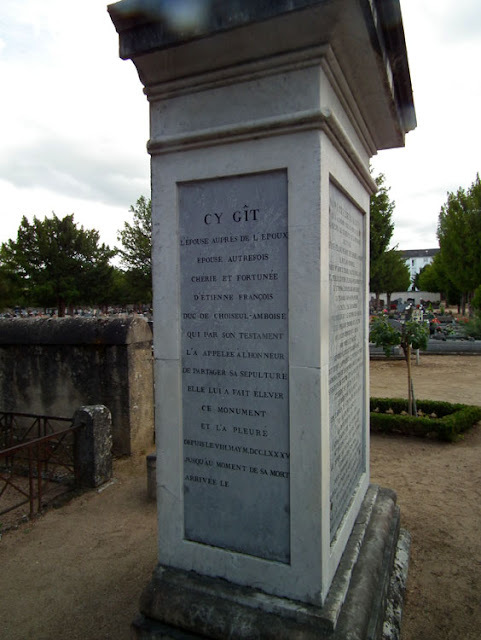 19th century historians believed that the site was Roman in origin, and they've been known as the 'Greniers de César' since at least the 18th century. We know that the Romans chased the Turonien Celts off the plateau in the first century BC. The Turoniens had lived there for centuries, but there is no evidence that Julius Caesar was ever in Amboise. The eastern tunnel, level two. A municipal archive document from 1548 mentions the digging of tunnels for Sir Jehan Gastignon, herbalist-apothecary royal. So the tunnels would have been simple quarries, and the stone used to construct a quay on the Loire. On the death of Gastignon the 'Granaries' were sold to the monks of Les Minimes, the convent next door. They modified the tunnels and added the wooden floors to use the complex to store tithes of cereals. They also dug four silos to dry their grain. The silos are brick bottle shaped constructions with a void between the bricks and the rock. Originally the gap between the inner and outer skins of the silos was filled with sand dredged from the river, to control the humidity and keep the grain dry. A staircase links the river to the plateau and comes out in a private garden just beyond the Chateau Royal grounds. Trapdoors allowed the grain to be dropped in from the chateau level, stored in the central brick bottle shaped silos and dropped through to the ground level when the time came to take the grain away for use. Nowadays the silos are also enfilade, with doorways leading from one to the other. These were added sometime before 1830. The underside of one of the wooden floors dividing the main tunnel. 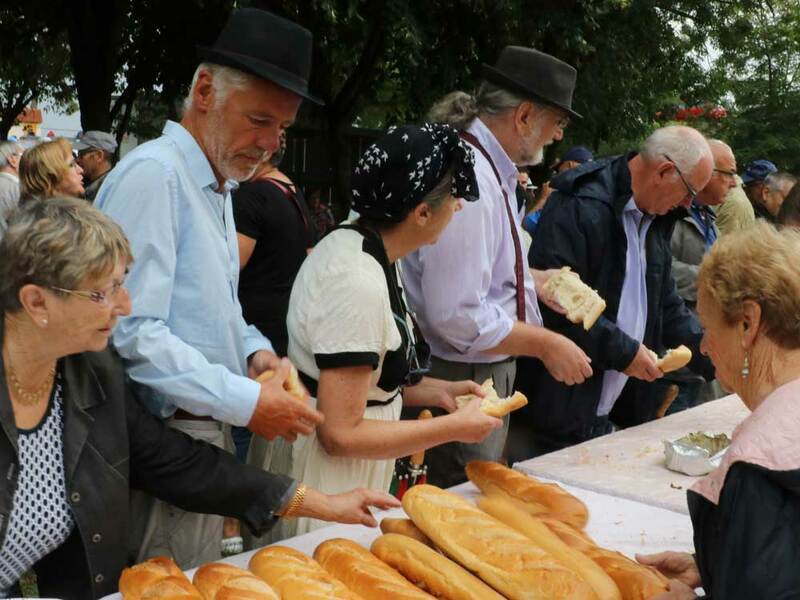 At the Revolution the religious community was evicted from les Minimes and the granaries abandoned. 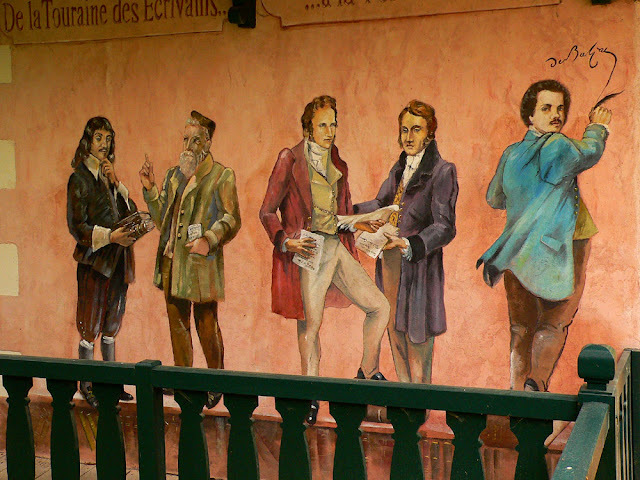 In the 19th century they became the property of the chemist Chaptal, who bought the Choiseul estate. The cone shaped objects you can see on the cornices in some of the photos are sugar moulds from Chaptal's factory. No one knows why they are now in the tunnels. 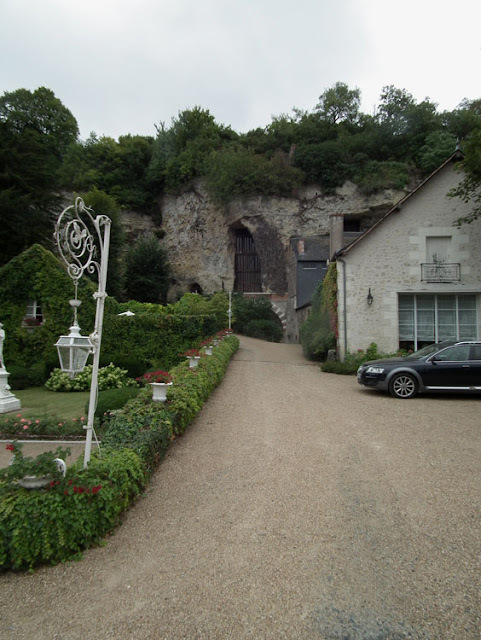 Later the tunnels became wine cellars, and are now owned by the Hotel Choiseul. The staircase from looking from level two up to the plateau. For more information (in French) with diagrams, check out Touraine Insolite. 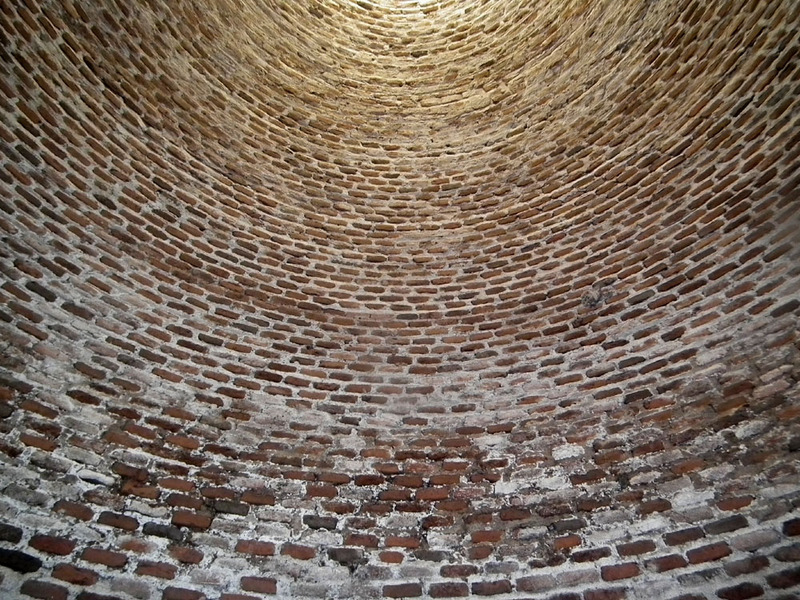 The inside of one of the silos. Many thanks to Grégory Millet, our guide at the Greniers de César, who took the time to email me his notes after our visit. Grégory is a professional guide working for the Tourist Office in Amboise and can be contacted there for any information about the area. Tourangeau writers as portrayed on the chalet at Chanceaux près Loches. Photo courtesy of my father. 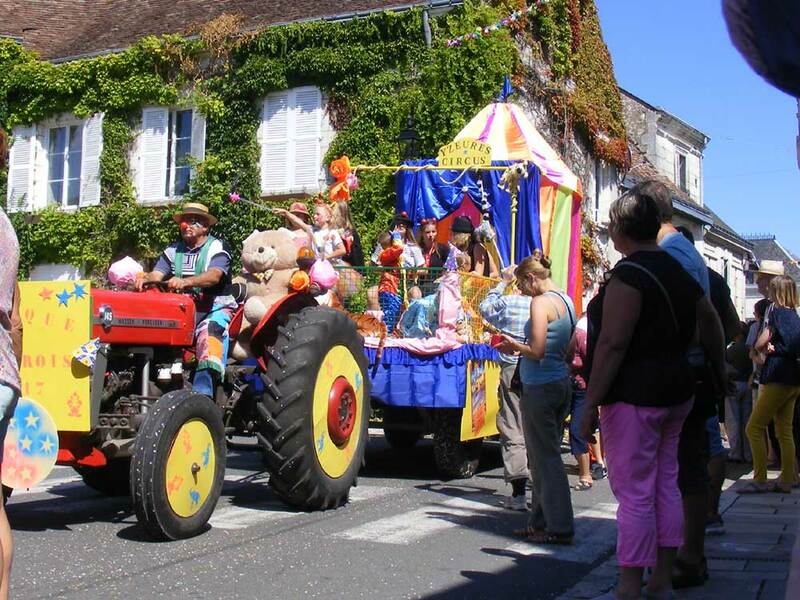 On 8 August 2017 local celebrity Gonzague Saint Bris was killed in a car accident in Calvados. 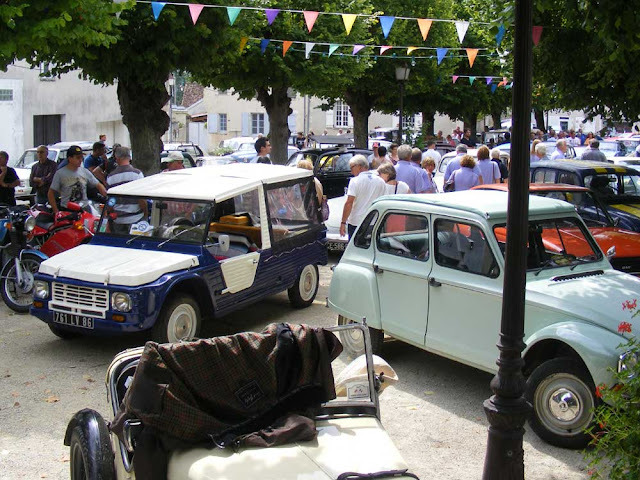 The newspapers were full of it and the Touraine in shock, not least because it happened just before his long running annual book festival at Chanceaux près Loches is due to take place. Referred to by all the locals by his first name, the funeral service at Saint Denis in Amboise was packed and overflowing according to friends of ours who live close by. By contrast, the interment was private and family only. When we visited the family grave there were wreaths from the great and the good in abundance (Carla Bruni-Sarkozy is one I recall, but there were many more). 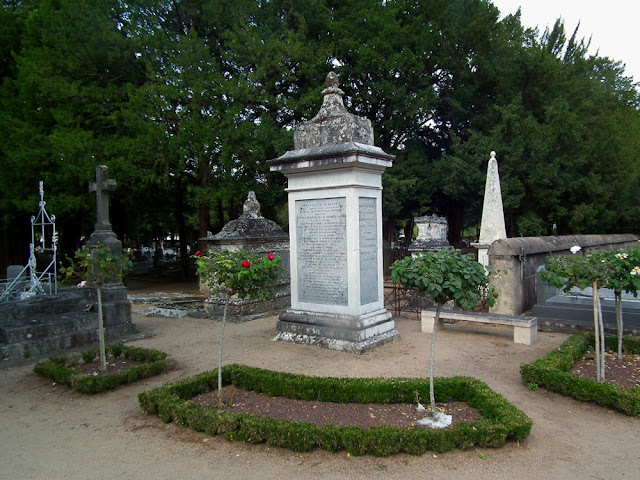 The Saint Bris family grave in Amboise cemetery. Born in 1948 in Loches, the son of a diplomat, he became a writer, publishing novels, histories and many biographies. His family had made their fortune as foundry owners in the 19th century and in 1855 they bought Clos Lucé, which is where he grew up. Self-taught, he became a journalist and radio presenter, then director of strategy and development at the famous French publishing house Hachette and head of the Ministry of culture and communication. He became a women's magazine proprietor and the royal correspondent for Paris Match. In 2014 he recreated the journey across the Alps made by Leonardo da Vinci on the back of a mule in 1516, after he was invited to come to France by François I. 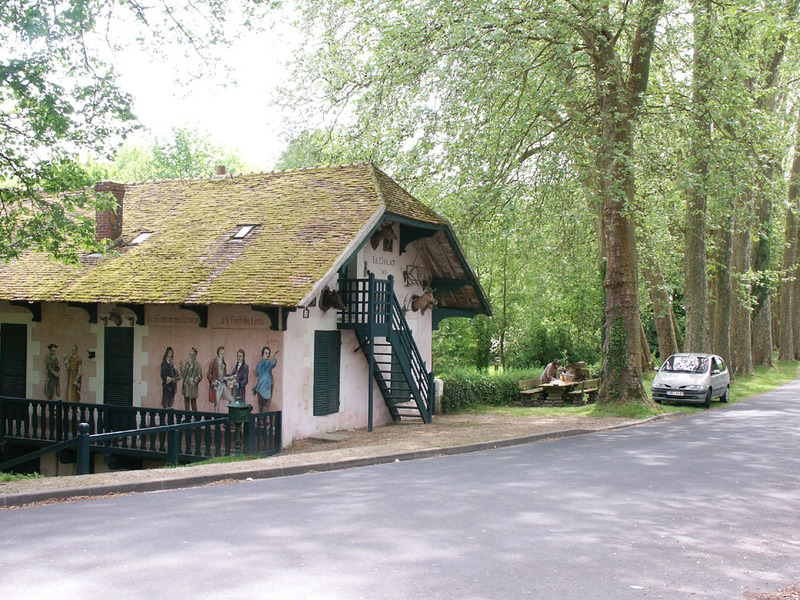 The chalet at Chanceaux près Loches. At the time of his death he was best known locally for the literary festival known as La Forêt de Livres, held annually in the tiny hamlet of Chanceaux près Loches for more than 20 years. The festival is free to all, hosting 150 authors who are there to promote their latest books. 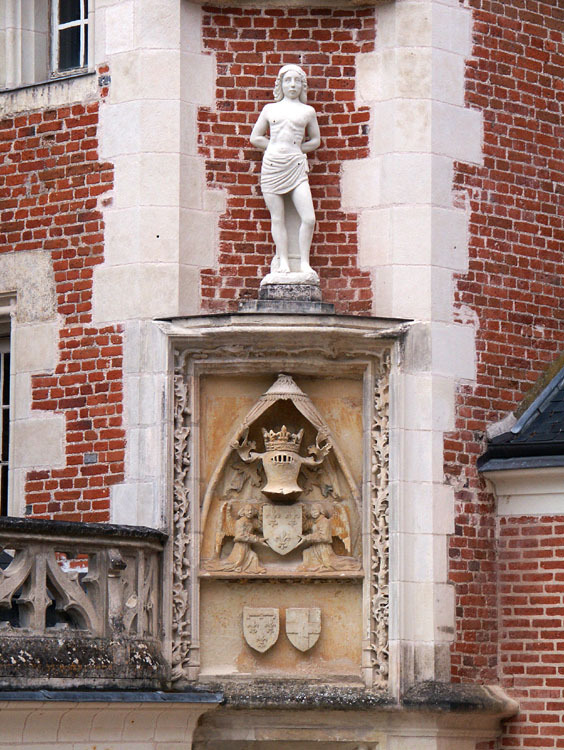 Detail of the facade of Clos Lucé. 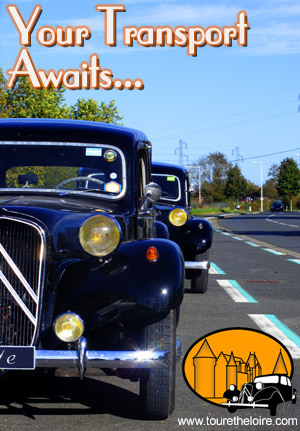 He died in a car accident near Pont L'Eveque earlier this month. The car was driven by his companion Alice Bertheaume, late at night as they returned from a party. She swerved to avoid a wild boar and hit a tree. Both of them were thrown from the car. He was killed instantly, she is still in hospital, in a critical condition. 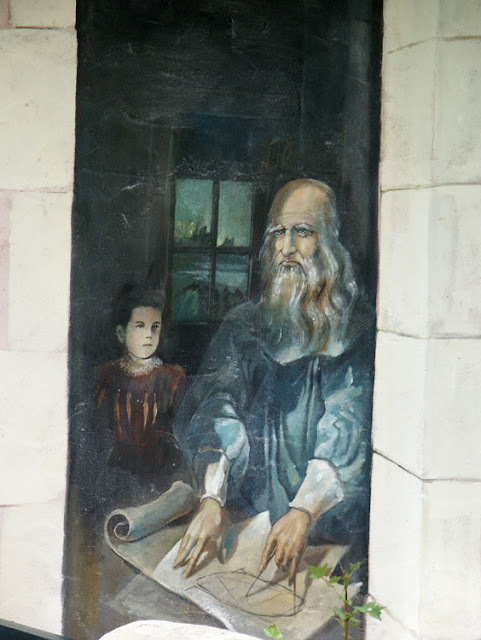 Leonardo da Vinci as depicted on the chalet. La Forêt de Livres will be going ahead, and his brother continues the family occupancy and presentation of Clos Lucé to the public. Gonzague never managed to get elected to the Académie Française, but I suspect he was that rather undervalued creature, an enabler. Locally he seems to have been widely liked and appreciated for his loyalty to the area, and he brought a great many people together to enjoy the literary arts. I never met Gonzague, nor went to the Forêt de Livres, but I have been struck by how people have responded to his death -- perhaps rather sentimentally parochial, but genuinely mourning the fact that he is gone from their lives. 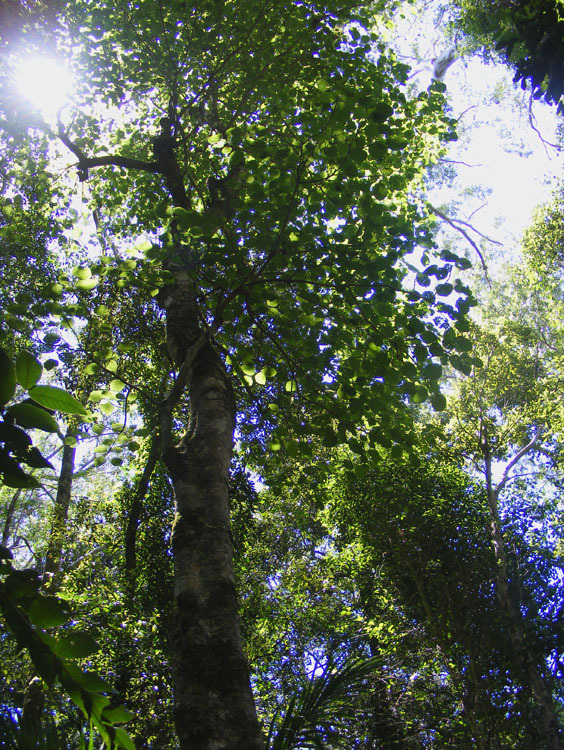 Where the rainforest has been opened up by cyclonic storms you will find the notorious stinging trees growing. 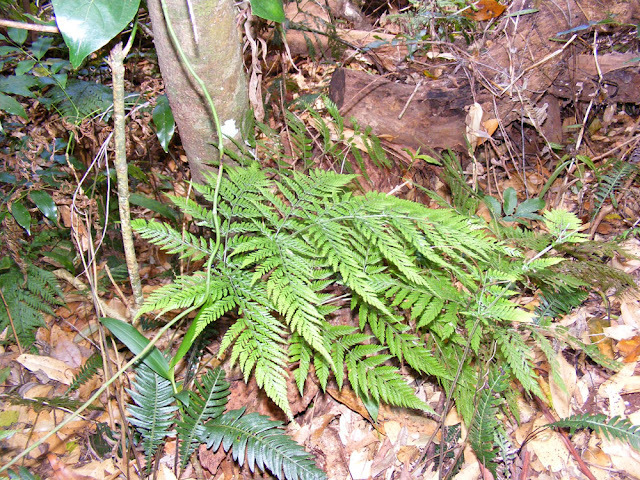 In south-east Queensland there are a couple of species. The one in my photos is Giant Stinging Tree Dendrocnide excelsa, which can inflict severe pain that can last for several months. Looking up into the crown of a Giant Stinging Tree. 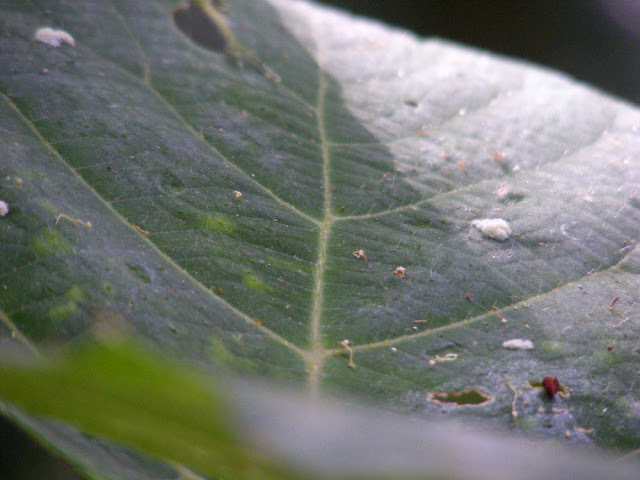 The Dendrocnide species belong to the Stinging Nettle family Urticaceae, and just like the common European herbaceous plant they carry stinging hairs, which if touched, deliver a neurotoxin. 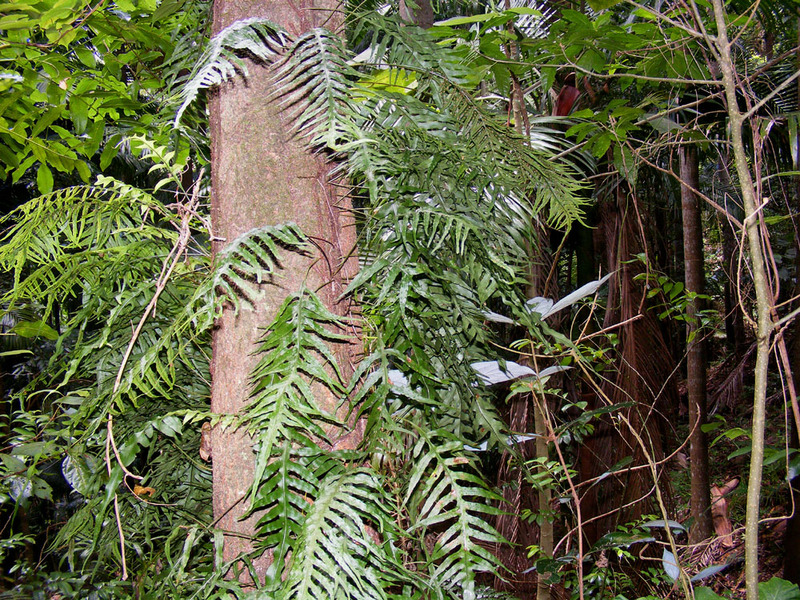 Giant Stinging Trees are not as dangerous as Gympie Gympie D. moroides, which causes agonising pain and has been responsible for the suicide of victims. Check out those urticating hairs. 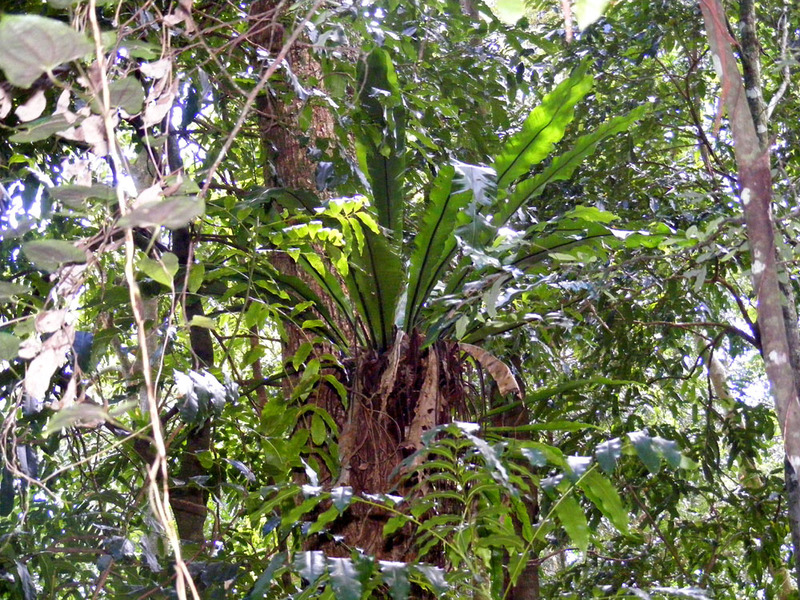 The trees are hairy all over, and can sting livestock and people. There are reports of horses and dogs being killed if contact with the tree is too comprehensive. First aid advice if you are stung is to use leg wax depiliatory strips to remove the stinging hairs. 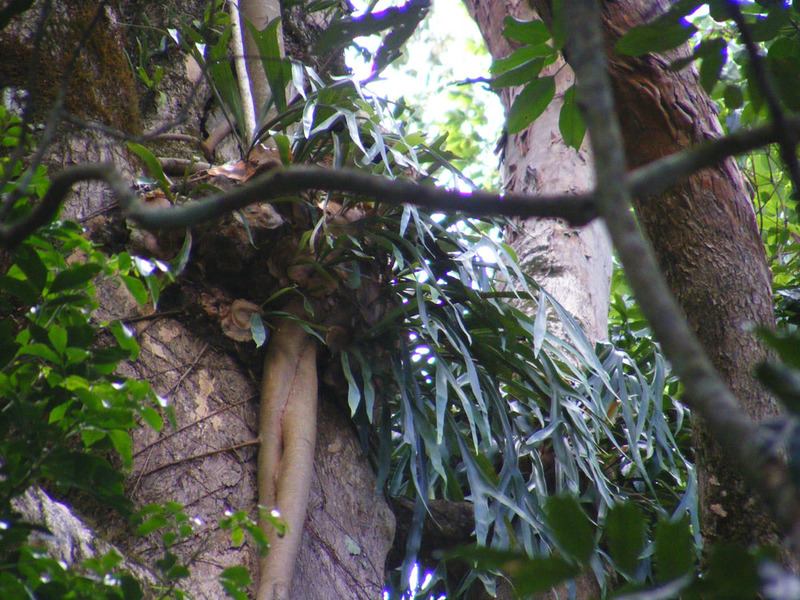 Wildlife, especially birds, often seem to be immune or have some protection against the stings, and the leaves and fruits are eaten by certain species. Aboriginal people obviously had ways of dealing with the stings as they used fibres from the tree for making nets and ropes. 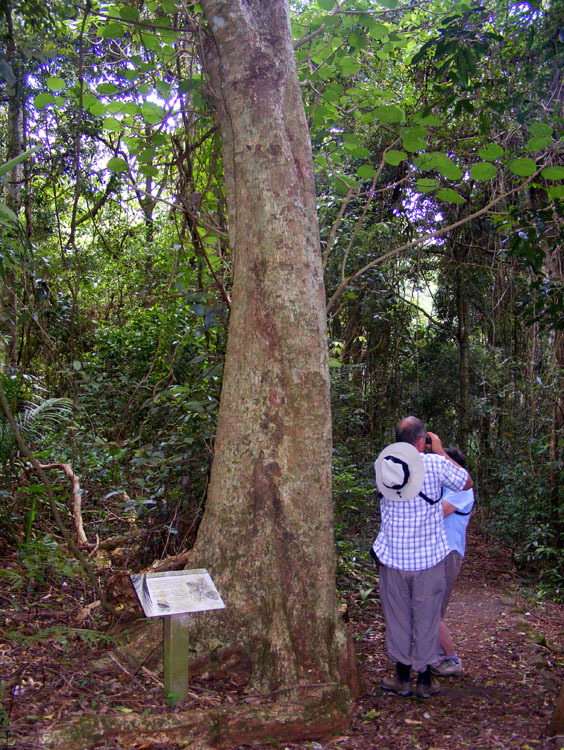 Giant Stinging Tree is a typical rainforest tree, up to 40 metres tall, with a buttressed trunk. 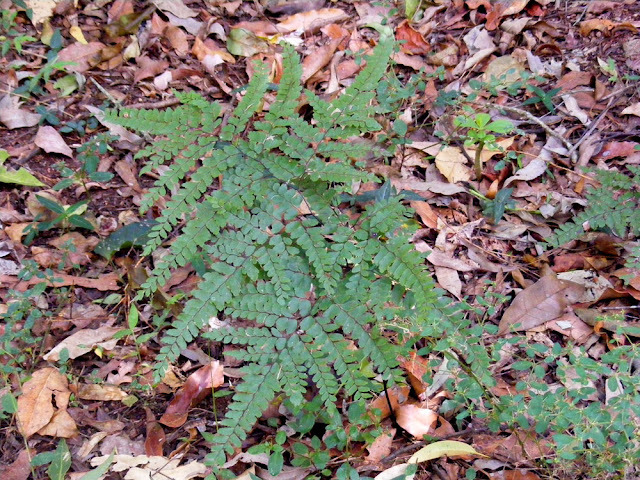 The leaves are heartshaped and can be 30 cm across. When we visited M. Denis last week he asked were we going to the Assumption Day rally at Lésigny? It's free, fun and there's lots of people. Free and fun are our scene, so we did some investigation, and yes, it appeared you just rolled up (with picnic and old car) and took part. 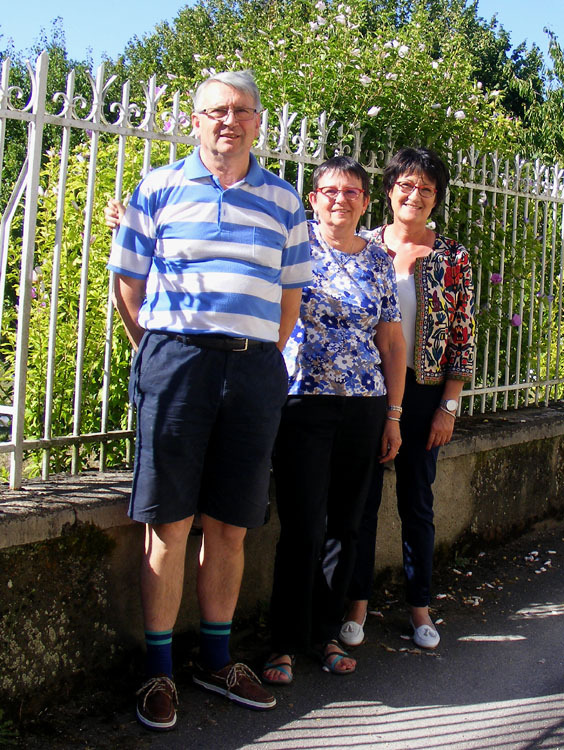 We invited Huub, Ingrid and Anne-Loes to come and picnic with us, so as suitably 1960s attired as you can be spontaneously, we piled into Claudette and headed to Lésigny. It was raining and thundering as we approached, but the prospect of a free breakfast meant that we weren't turning around. By the time we arrived the rain was a light drizzle, so we took our umbrellas and made for the food tables. Once breakfast was out of the way we took to our cars - then sat gently steaming while the rain bucketed down for 20 minutes of so. Then we were off!! 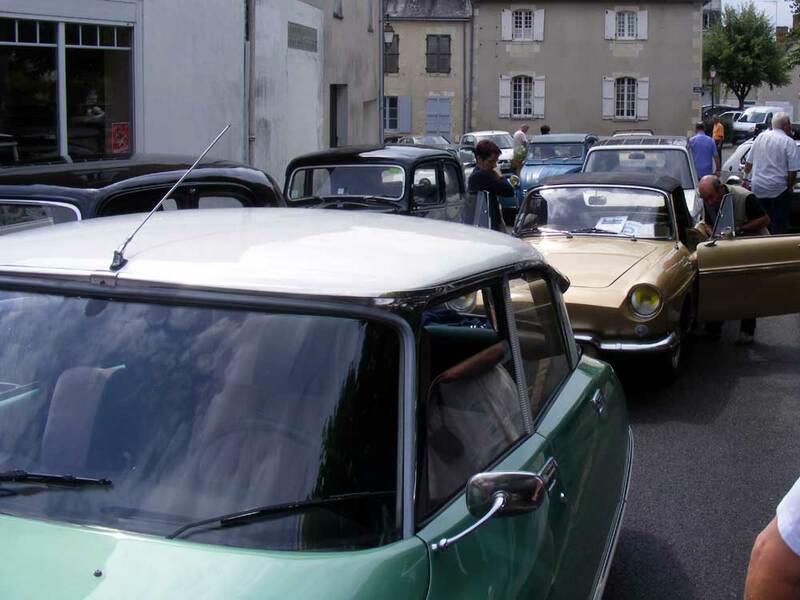 We travelled via La Roche Posay, Vicq sur Gartempe, and Néons sur Creuse to Yzeures, where we all parked up and were invited into the salle des fetes to be provided with apéros. Along the route people had turned out to watch, and the princesses in the back almost exhausted themselves perfecting their royal waves. From Yzeures we travelled back through la Roche Posay to Lésigny, where we snaffled one end of a long picnic table, laid out our food (too many wonderful things to list). At the other end of the picnic table were a couple of other groups of picnickers, and soon the comestibles were travelling the length of the table, as slices of our quiche were exchanged for slices of their tomato tart, and our mayonnaise travelled up and back because we were the only people who had remembered. This is typical of these sorts of car events - you bring your own picnic, sit with strangers, and soon you're all one big family group. Telephone numbers and email addresses were exchanged, and a thoroughly convivial time was had by all. After lunch and we are all looking at each other's cars. There's something I think I may have forgotten to mention.... Susan made a "French Apple Pie" which caused amusement (being something French people have never heard of), so it was sent up the table for everyone to sample, and in return we were pressed with apricot sponge, chocolate brownies, moelleux au chocolat and apple clafoutis. Five desserts. That's what I call a picnic! We wrote the other day about a mystery float in the parade for the Comice Agricole, and it was suggested it was the float from Yzeures. And look who's driving it - it's M.Denis, to whom we entrust the care of Celestine & Claudette! M.Denis has recently retired from owning and running quite a large Renault concession and general mechanics, and has rented a shed to concentrate on fixing old tractors. He also works on various classic cars, and always does a stellar job of greasing the Grand Dames' various creaks and aches, and can be relied upon to ferret out any little problem we may have. 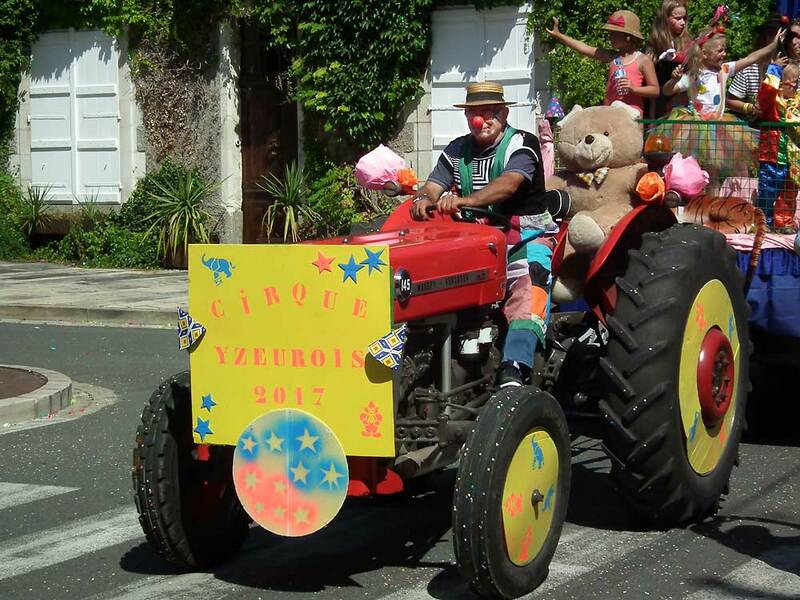 The Yzeures Circus float had been in his workshop the last couple of visits (both cars recently had a pre-roadworthy test check-up) and we saw it in various stages of creation, but we didn't realise M.Denis was going to be all clowned up and driving. 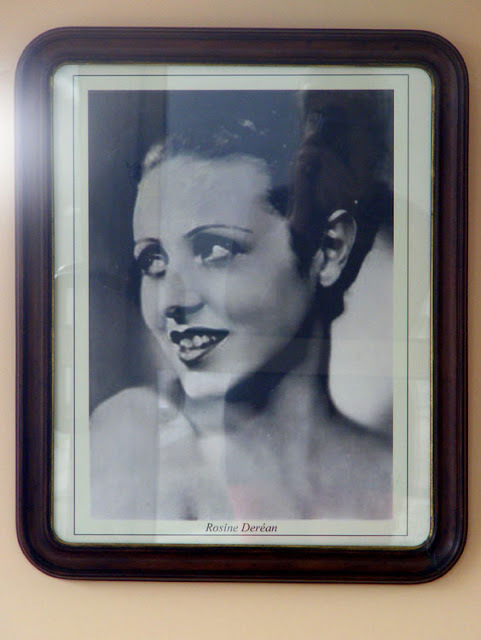 Rosine Deréan was a French actor, born in 1910 in Paris, and dying in obscurity in Genillé in 2001. Married to the comedian Claude Dauphin, she was deported to Ravensbruck during the Second World War. After the war the couple separated and she slowly disappeared from public view. Earlier this year Christophe Meunier, a local historian and university lecturer, published a biography of this little known French movie star and Resistance heroine. The plaque honouring her memory as a forced labourer. 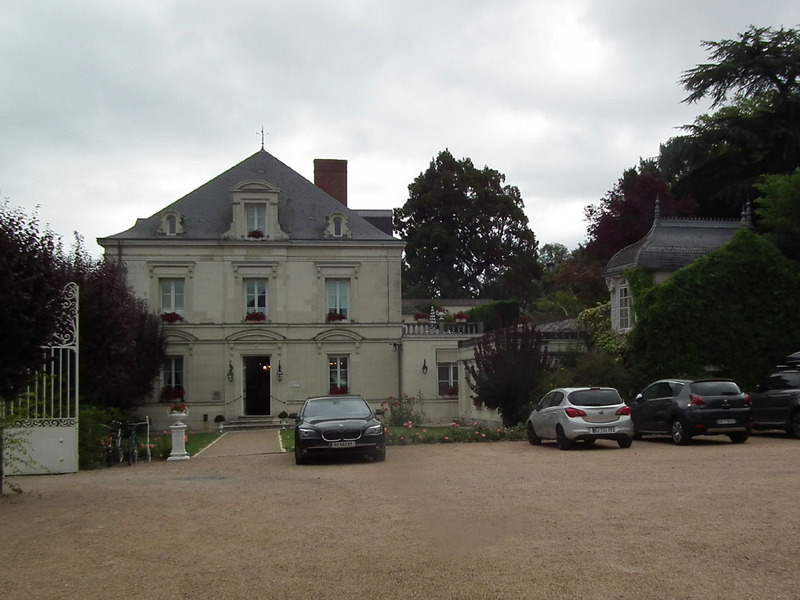 She and her husband bought the chateau de la Bourdillière at Genillé in 1939. Although she lived a long and full life, her career as an actor was relatively short, and she last appeared in a film in 1956. During the Second World War, with her anti-Nazi husband having escaped to London via submarine, she joined the Resistance network Amarante. After being denounced she was arrested and interned, along with Geneviève Antonioz-de Gaulle, at Ravensbruck in Germany, where she was put to work making rope, and from where she was liberated on 30 April 1945. Scarred by these events, she returned to Genillé but was unable to really re-launch her career. 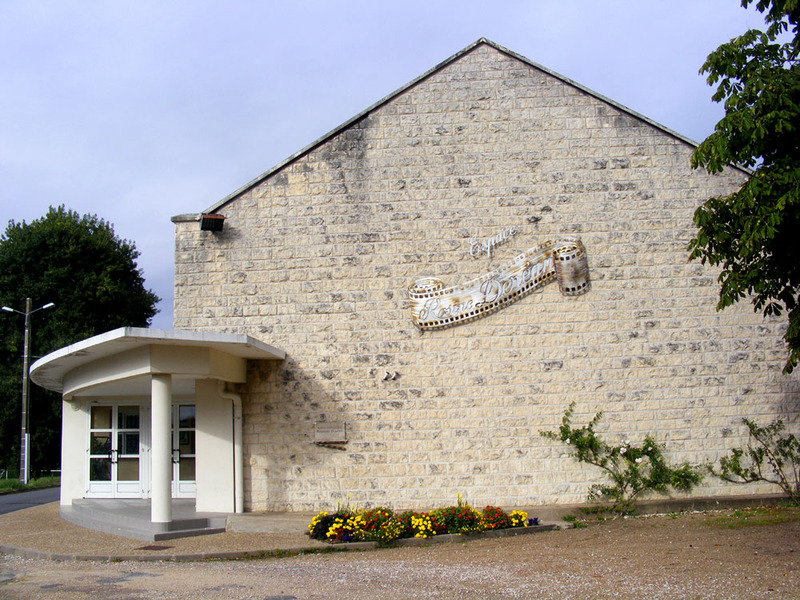 The community events venue in Genillé is named after Rosine Deréan. Admired for her delicate beauty and elegance, her most successful film was a tearjerker called Les Deux Orphelines, directed by Maurice Tourneur in 1933 and co-starring Renée Saint-Cyr. She and her husband were celebrities, regularly seen out on the town in Paris. By the late 1930s they were working together, starring in films such as Les perles de la couronne, in which their personal alchemy was commented on. 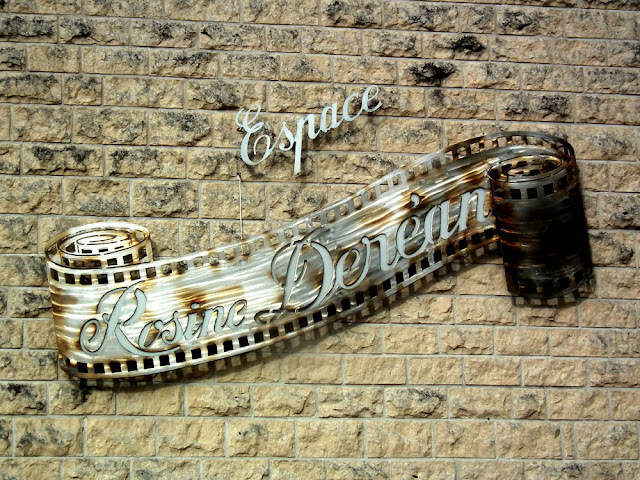 The Espace Rosine Deréan, the community events venue (Fr. salle des fêtes). Despite her having worked with the greatest directors and actors of her day between 1931 and 1939, there was no personal archive for her biographer to trawl through. He had to piece together her story like a detective from hints, traces and personal testimonies. Photograph of Rosine Deréan in the salle des fêtes in Genillé. 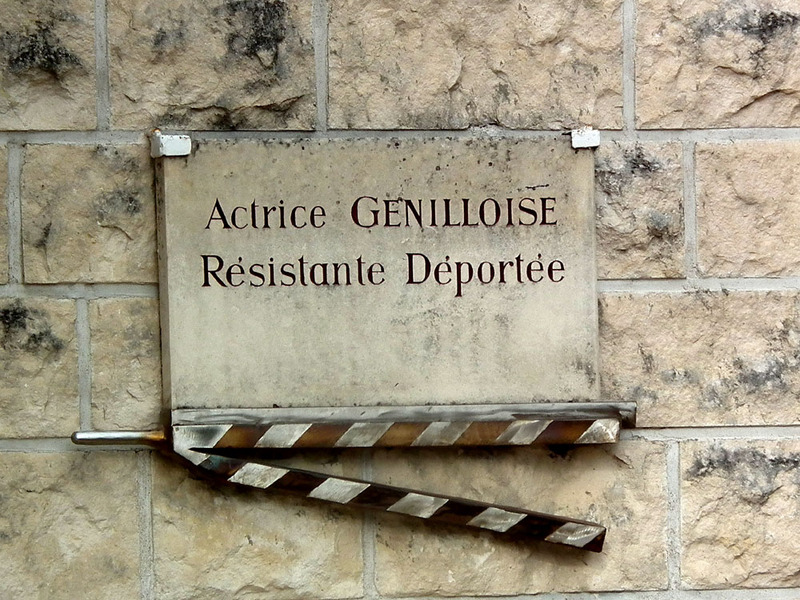 Adrian Matthews has written about Genillé Under the Occupation on his blog, an account of a guided visit around the village with Christophe Meunier.